Town or country. Beach or waterfall. Indoors or outdoors. 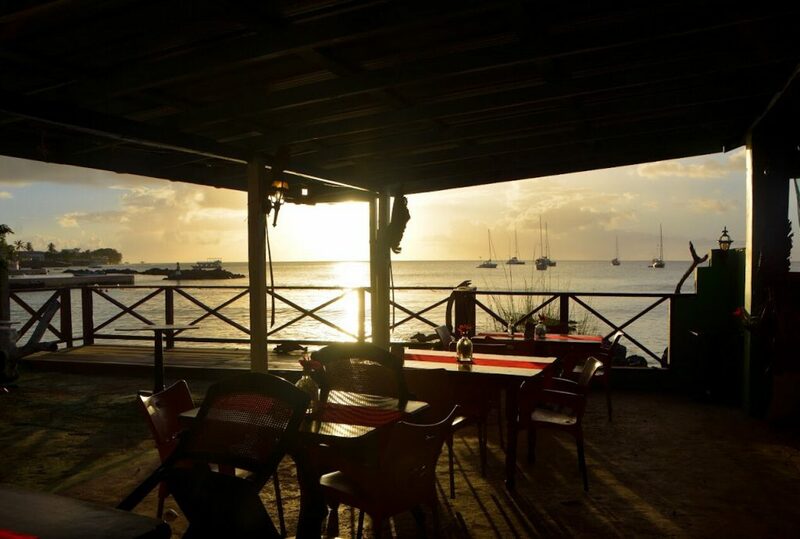 There’s no shortage of ideal spots for you to enjoy a drink in Tobago. Premium spirits and award-winning cocktails may be few and far between, but when you’re on an island dubbed ‘God’s real estate’, your local watering hole is pretty much only as good as its view. Here are 7 bars in Tobago (and one bonus spot) that serve up their drinks with a side of million dollar vistas. All for the price of one beer or cocktail. Cheers! Paradise Point a.k.a. Glasgow’s is one of those mandatory stops you have to make if you’re road tripping along the island’s north coast. The two story bar is located high above the fishing village of Parlatuvier, offering a view of the bay that will almost literally take your breath away. Few vantage points offer such an uninterrupted bird’s eye view of any of the island’s idyllic coastal towns, so I highly recommend choosing Glasgow’s as a rest stop in either your going or your coming. Have a seat between two precocious parrots clucking away on the ground floor, or make your way up the narrow staircase to the top deck, where the sound of the wind chimes coupled with the cool breeze might very well lull you to sleep. Driving along Windward Road, its easy to write off Speyside Overlooking as just another ordinary roadside bar. The red, yellow, and green wooden facade visible from the street is small and unassuming, but cross the threshold and you enter a space much larger and much more refined than you could have expected. The wooden structure to the front pays homage to the establishment’s humble beginnings in 1996. However, it has since expanded to include a spacious, well appointed restaurant that caters to everything from idle road trip stops to weddings. Whether by design or happenstance, the minimalist decor makes the focal point of the room the stunning sight of nature’s bright greens and vivid blues through the panel of windows that occupy the entire back wall. The owner, Toney, is a friendly guy who’ll happily sit and chat with you on a slow day so give yourself enough time to knock back a drink or two and soak in this priceless view of Speyside. There’s always a crowd at Renmar’s Restaurant & Bar. Not surprisingly though, because who doesn’t love the idea of being able to walk straight out of the water and up to a bar to order a beer or cocktail? 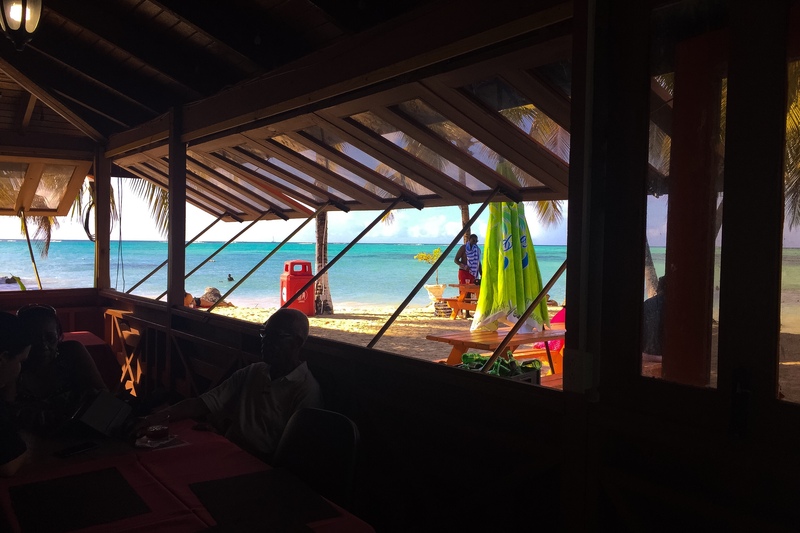 Situated at the very edge of the Pigeon Point Heritage Park, just a few feet from the shoreline, Renmar’s has become somewhat of an institution among bars in Tobago over the years. With indoor and outdoor seating options, its a great place to grab a drink, listen to music, and look out at the Point’s startlingly blue waters and seemingly always blue sky. Bonus: Renmar’s always offers up a delicious menu of local food, making it that much easier for you to spend an entire day on the Point. Pigeon Point Heritage Park is lucky enough to have two great bars with two distinct selling points. 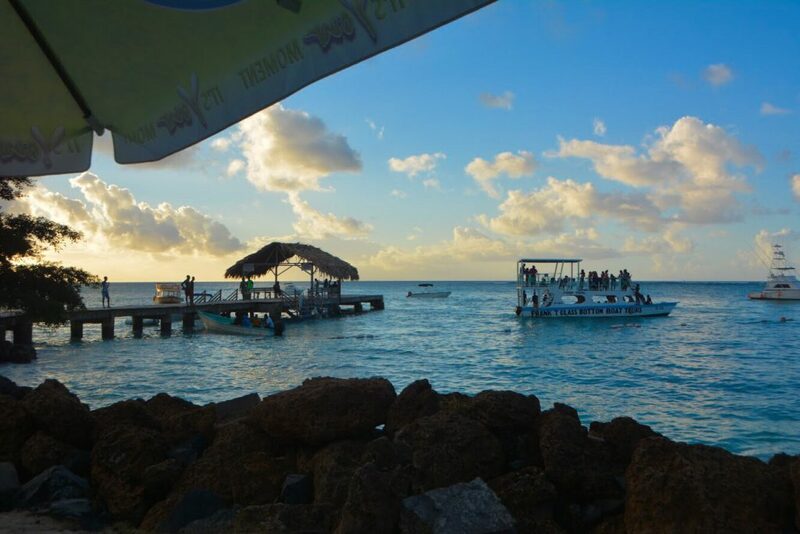 While Renmar’s grants you easy access to the water, Traditions Beach Bar & Grill offers you the best view of the famous Pigeon Point Jetty. Whether you’re seated at the bar looking out onto the water, or at one of the picnic benches stationed right outside, you’ll be able to take in the beautiful sight of the iconic thatched roof hut against the dramatic backdrop of a bright blue sky. Or soak in the beauty of its silhouette against the yellow sky at sunset. Whichever you prefer. Bonus: Tradition’s is also the only bar in Tobago serving up the most DELICIOUS mango chow shot. You absolutely have to try it. Especially if you’re there all day and have enough time to sleep it off under the shade of a tree. Situated just a few feet from the water’s edge, this no-frills bar has all the vibes and quirky island charm you’d expect from a beach-front establishment that caters to both locals and visitors. Rough, painted concrete floors and mismatched dining room furniture give it an almost homey feel. On the flip-side though, the collection of international license plates and strategically placed beer ads remind you that its definitely a place where people come to indulge in a drink or three. 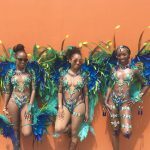 While the musical selections vary from soca and reggae to disco and soft rock (probably dependent on the mood of the proprietors), one thing always stays the same – the gorgeous front-seat view of Swallows Beach. It’s a wonderful sight to take in any time of day but I strongly recommend scheduling this stop into your early evening plans, just in time to see the sunset. 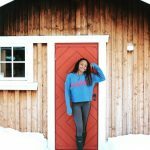 Bonus: Bago’s has a dining menu which includes an excellent steak dinner so you can easily spend a couple of hours soaking up the full experience. Housed in a small wooden structure perched just above Store Bay beach, Man on the Rock is one of those bars in Tobago that have mastered the art of making kitschy look cute. Colorful graffiti, football paraphernalia, off-color signage and a sandy floor all come together in just the right way to make what could otherwise be considered a ‘basic bar’ feel like a unique brand of beach chic. The drinks menu is limited and occasionally you might not be able to get a beer because “the truck didn’t pass today” (true story). But the view of the bathers and boats bobbing on the surface of the mostly calm waters will appease you enough for you to enjoy any alternative drink options that are available. 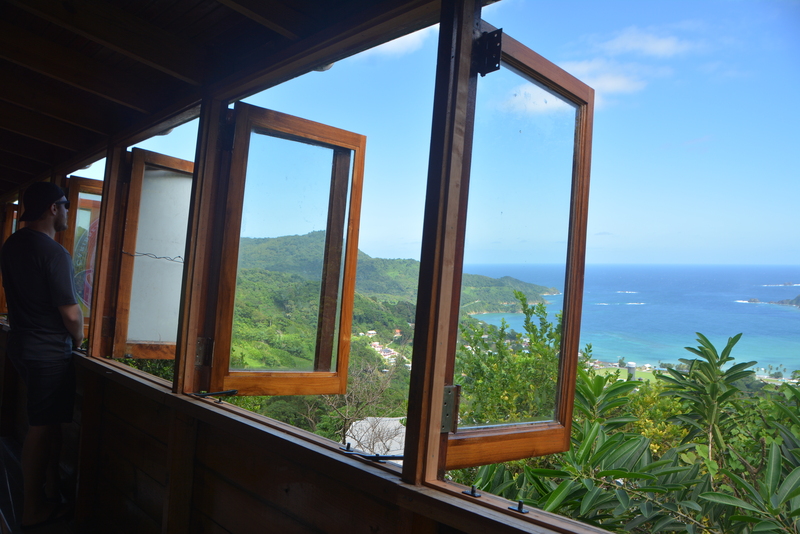 Not all of Tobago’s spectacular views include the ocean. Some of the island’s most gorgeous scenery can be found within the lush greenery of the rain forest. 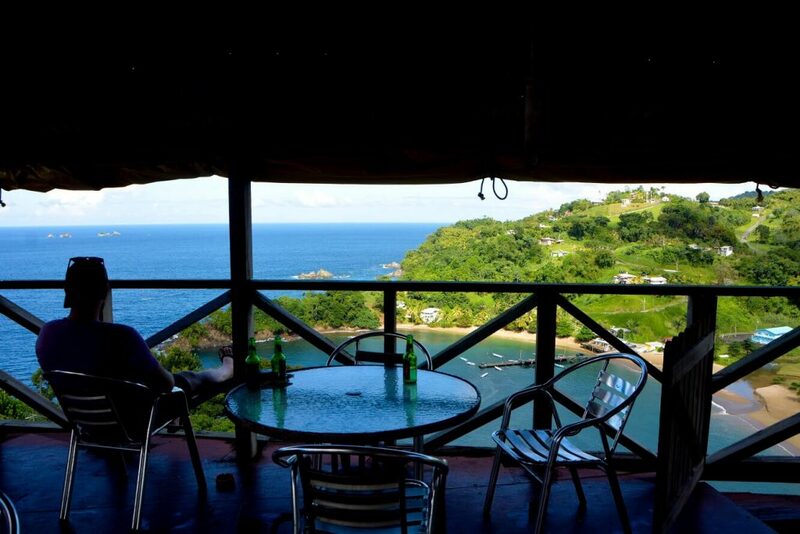 Sunshine Bar in Bloody Bay is one of the few bars in Tobago that gives you a great view of just that. Sit on any one of the decks in this spacious, multilevel bar and enjoy a Stag, Carib or any other cold, bottled beer in stock. The chirping of the birds just outside makes it feel almost surreal, but the sight of the emerald green trees stretching out before you for miles is as real as they come. I know, I know…the Nylon Pool is a sandbar, not a bar-bar. But I’m taking the liberty of stretching the truth just a little bit, based on the sheer uniqueness of this experience. Picture it: sipping rum punch while standing in clear, waist-deep water miles away from the shoreline. Water that allegedly possesses the power to handsomely endow men, reverse the signs of aging in women, and grant couples a lifetime of happiness if they kiss beneath its surface. 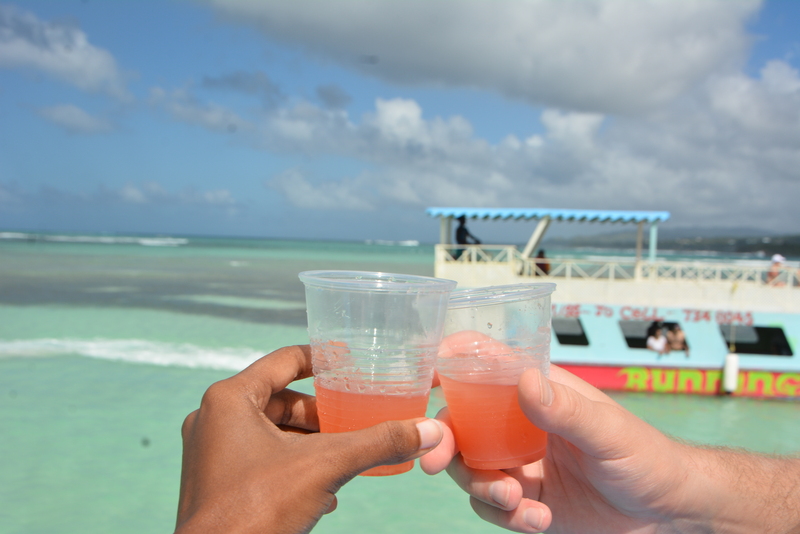 Note: All glass bottom boat tours don’t offer complimentary drinks so ask before you purchase your ticket. If you’re fortunate enough to get that drink, enjoy at least one serving of rum punch while cooling off in the rejuvenating water. All I ask, is that you be responsible about disposing your cup when you’re back on the boat. 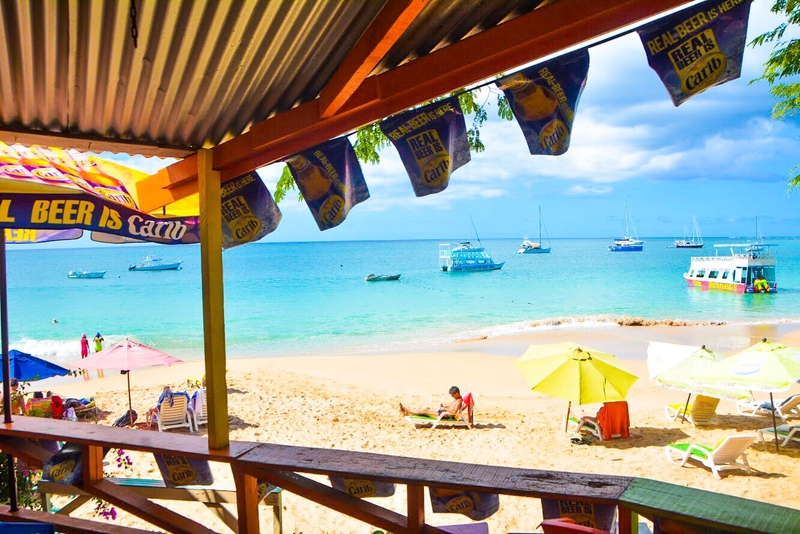 If you’re on the hunt for a bar in Tobago that serves up more than just alcohol – a location that delivers both good booze and gorgeous views – this list should get you off to a good start. 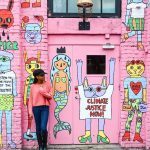 Bookmark this post however, because I’ll be adding more bars as soon as I discover a new gem! 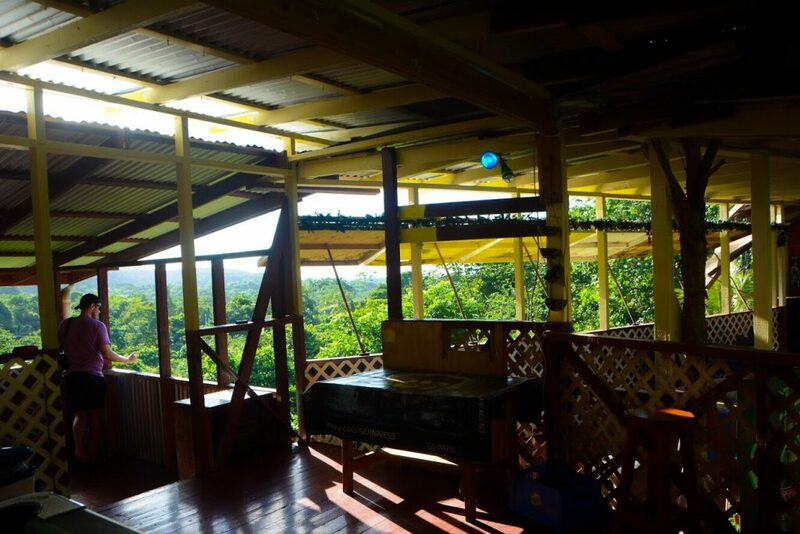 Do you know of other bars in Tobago with awesome vibes and breathtaking vistas? Tell me in the comments. I’d love to check it out! Tobago looks…Amazing! Love the photography! It looks so relaxing and inviting! It is truly amazing! Thank you so much! 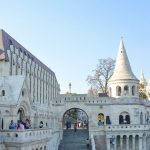 I hope you’re able to visit sometime and see for yourself! Wish I had seen this 4 years ago. I went to T&T for some serious kiteboarding in pigeon Point and only went to Renmar’s Restaurant & Bar on this list. However, I will say that my kiteboarding instructor did take me to several local dives in Bucco which was fun yet a wee bit scary! Lucky you! I’ve always wanted to try it but don’t think I’m strong enough. Renmar’s is great and since its right there it was also convenient. Lol @ a bit scary…I understand what you mean but I’m hoping to spend more time exploring that village next year. If you remember any great bars there though, do let me know and I’ll happily add it to the list. Overall, so happy to know you were able to visit my beautiful island! Those views though?!! Gorgeous! I would gladly sip a cocktail at any of those bars, but Man on the Rock bar looks like that place I could spend all day!! Good pick! Man on the Rock is located at Store Bay Beach Facility which is perfect for an all-day stay – there’s a food court, 3 bars, restrooms, a craft market AND you can access glass bottom boats there to tour the Buccoo Reef and Nylon Pool! The sea is an outrageous colour of blue there! I don’t think it would matter what we drank, we would LOVE IT there. Yes, our water is AMAZING! 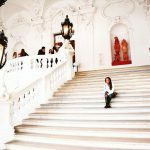 You should definitely plan a visit so you can take in live! All of them have incredible views! I would go just for that. Do they serve good foods too? I agree, the views are definitely enough! Out of all of them only Renmar’s, Traditions and Bago Beach Bar serve food – all yummy! Lovely views. 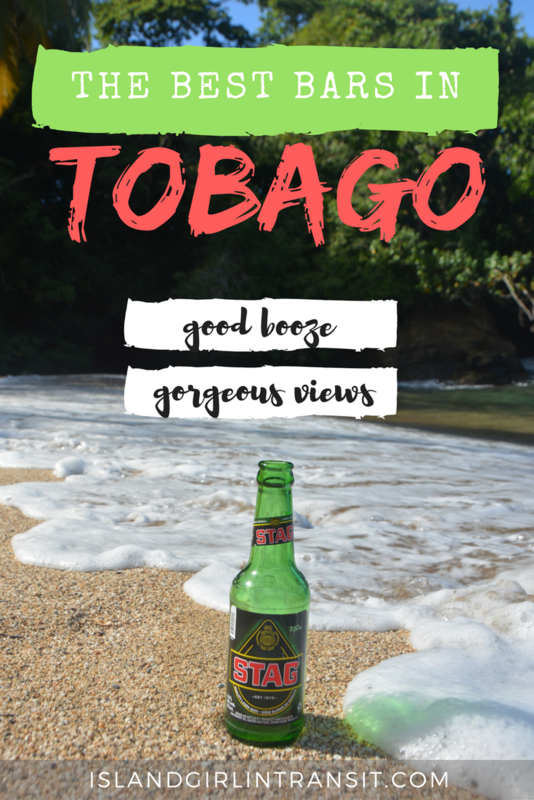 Thanks for sharing more about Tobago! Thanks for stopping by! And you’re very welcome! All of those bars look wonderful! I love siting by the beach with a cold cocktail and watch wonderful beach view! Thanks for recommendations I hope ill get to visit Tobago one day! Tobago looks like an awesome place for a long vacation. I’m totally impressed by all the beautiful pictures. Thanks for your sharing. Tobago really is great for a long-term stay…you should give it some thought. I think you’ll enjoy it! Tobago looks like a reall hidden paradise! The views from these bars are just incredible and the sea is sooo turquoise! On can feel the really relaxed atmosphere from your pictures. It is a great, chill place to escape. And the truth is these photos don’t do the island justice! I have not read a whole lot about Tobago, but I would definitely like to visit! Some of these bars overlooking the ocean look pretty amazing — not a bad way to experience the island! I agree! Bar hopping around the island and taking those view was definitely fun! Uh yea! Tobago looks fantastic and bars seem to face some of the most beautiful spots. Would love to have a pub crawl there.